Liliana Afonseca was excited about the settlement. She works at the Westin Copley. 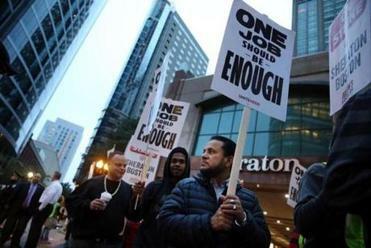 Striking Marriott employees will return to work Wednesday after members of the union representing the workers overwhelmingly approved a new contract Saturday with the hotel chain. “We have taken a tremendous step forward in the direction of one job being enough for hotel workers in this city,” Brian Lang, president of Unite Here Local 26, told reporters inside the Hynes Convention Center, where votes were being tallied following a union meeting late Saturday afternoon. Lang declined to release specific details of the agreement until the remaining 5,000 Marriott workers who are still on strike in San Francisco and two locations in Hawaii settle their contracts. In all, 8,000 Marriott workers walked off the job this fall, and agreements have been reached in four other cities — Detroit, San Jose, Oakland, and San Diego. In a statement to the Globe early Saturday afternoon, Marriott officials confirmed they had reached an agreement with the union. “We look forward to welcoming our associates back to work,” a spokesman said in an e-mail. The job action involves more than 1,500 employees, from housekeepers to bartenders to bellmen, at seven Boston locations. The new contract met the union’s goals, Lang said, including higher wages and ensuring employees are being scheduled to work enough hours to make a viable living. The new contract will also include better sexual harassment protections for women, paid parental leave, and other improvements in working conditions. The contract will last four and a half years, and employees will receive back pay to March 1, when the previous contract ended, he said. “Our members are walking back into those hotels with their heads high, feeling like equals, feeling like they’re been respected,” Lang said. Lang said the union had a good dialogue with Marriott over the past week leading to the agreement. “At the end of the day, Marriott stepped up, they have met all of our goals, they have set a new standard for hotel workers in the city, and we expect the rest of the hotel employers to do exactly the same thing,” Lang said. Mayor Martin J. Walsh, during an appearance at a community event in Jamaica Plain late Saturday afternoon, said he was thankful for the agreement. He said Lang had told him Friday night the union had reached a tentative deal with Marriott. Earlier in the day, Boston City Council President Andrea Campbell praised news that the sides had reached a tentative deal. 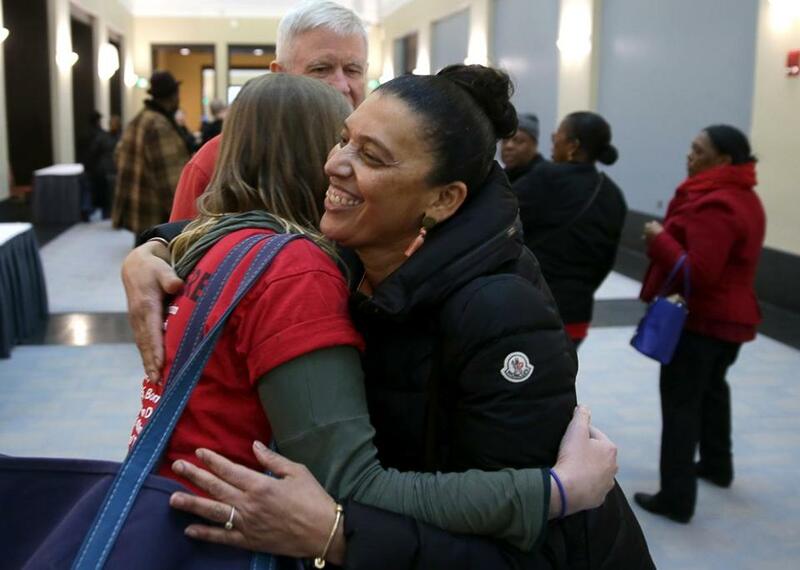 “I’m happy to see Marriott leadership and the union reach a deal that will set a new standard of benefit for these hardworking employees and ensure our hotel industry continues to thrive in Boston,” Campbell said. The work stoppage was the city’s first major hotel strike in modern history, involving 1,500 employees, from housekeepers to bartenders to doormen, at seven hotels, including the Ritz-Carlton Boston, Sheraton Boston, and Westin Copley Place. The Boston workers, who went on strike Oct. 3, were the first Marriott employees nationwide to walk out. 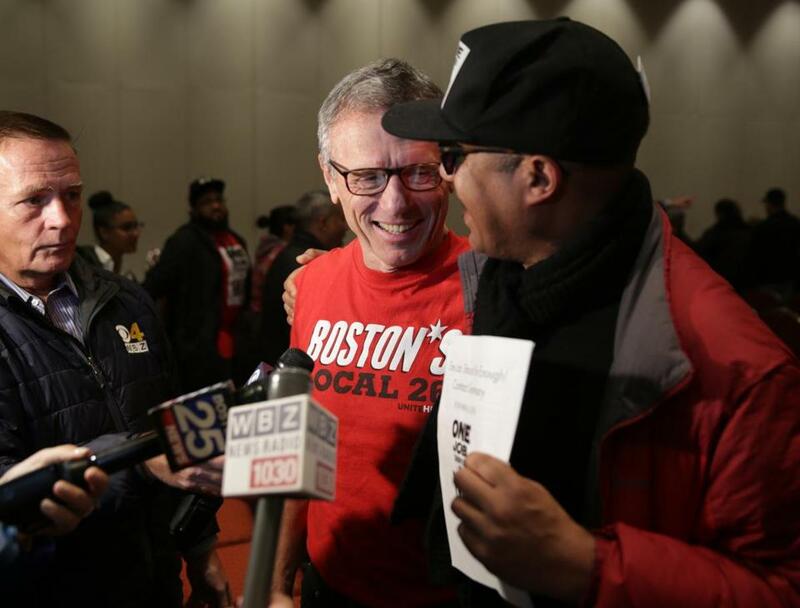 Local 26 will use the Marriott contract as a basis for its negotiations with the rest of the unionized hotels in the Boston area — there are 32 in all — a few of whom have already said they would agree to the same terms. On Saturday afternoon, hundreds of union members gathered inside a ballroom at the Hynes ahead of the closed-door contract vote. Cheers could be heard outside the ballroom as speakers addressed the crowd inside. Luis Castro, 34, a barback at the Westin Boston Waterfront told reporters the new agreement will mean better conditions for workers, including job security and fair wages. “We are very proud to do our job, and that is why we are here fighting for the contract, because ... we are proud to work with Marriott and we are proud to serve our guests and do the best for them,” Castro said. Lang, the union president, said he hopes that the deal will set the stage for other agreements between workers and employers. After the vote, members celebrated with cheers and embraces, while a few gathered into a circle and danced. Sebastiao Da Silva, who works at the Aloft Boston Seaport District, praised the agreement as he walked from the ballroom. “I feel great, I like it a lot,” Da Silva said. “There will be more benefits, especially for health care. Brian Konon, 49, who has worked at the Westin Boston Waterfront since 2006, said the agreement was important for workers living in an expensive city like Boston, where pay has not kept pace with the costs of living. He spoke outside the Hynes ballroom assounds of the cheers echoed down the hallway. “We didn’t get everything, but as you can hear from the crowd in there, we’re pretty excited. I think it was fair,” he said. Plus, it means the strike is finally over. “I’m just happy to go back to work, to be honest with you,” he said. Brian Lang (center), president of Unite Here Local 26, spoke to reporters Saturday after the deal was announced. Globe correspondent Alejandro Serrano contributed to this report. John Hilliard can be reached at john.hilliard @globe.com. Katie Johnston can be reached at katie. johnston@globe.com.